It can’t be helped that as the evenings get shorter and darker and the temperatures start to drop then our thoughts turn to warming, hearty comfort food for Autumn. Sadly for us a lot of these dishes are comforting because of all the delicious yet calorific things they contain – butter, sugar, cream, cheese….. which is why I’ve created this healthy alternative to the traditional Shepherds Pie that is not only lower in fat than the classic dish, but packed full of nutrients and vitamins to help support our immune system through the germ-filled Autumn months. Cheese to taste (using parmesan will reduce the fat content over using cheddar, if you want to make this version super low fat then nutritional yeast flakes will give a cheesy taste with none of the calories) – I used a handful of organic cheddar for this particular recipe, it just depends on your own personal diet. Heat a large pan of water and then add the diced sweet potato. Bring to the boil then simmer for around 20 minutes, or until sweet potatoes are soft. Once they are, set aside. You can prepare the pie filling whilst they are cooking. Heat a little oil in a large saucepan. I always cook using coconut oil (my oil of choice is Vita Coco) but use your preferred cooking fat. Add the onion and garlic and sauté until soft – do not allow to burn. This should take 3-4 minutes. Add the chopped celery and carrots and continue to cook for another 3-4 minutes before adding the frozen Quorn mince. Once the Quorn mince has started to brown then stir in the tinned tomatoes and when combined add a little tomato puree or passata to taste. I usually use around 2 tablespoons. Cook for 2-3 minutes and then add in around 200ml of hot vegetable stock (my go-to stock is Marigold Bouillon but again, feel free to use your own preference or indeed make your own veggie stock if you have the time), stir well to combine and then add seasoning to taste. I usually add a pinch of himalayan crystal salt, a pinch of black pepper, a pinch of dried mixed herbs and a splash of Worcestershire sauce, but season to your own taste. Bring to the boil then reduce heat and simmer gently until mixture has reduced and most of the liquid has evaporated (but ensure it does not get too dry.) Remove from the heat and then pour this pie filling into a baking dish ready to be topped and put into the oven. Drain the cooked sweet potatoes and then mash, adding a splash of milk and butter to make a creamy mash topping. Spread this topping over the Quorn mince mixture already in the baking dish, smooth over and then top with cheese of your choice. 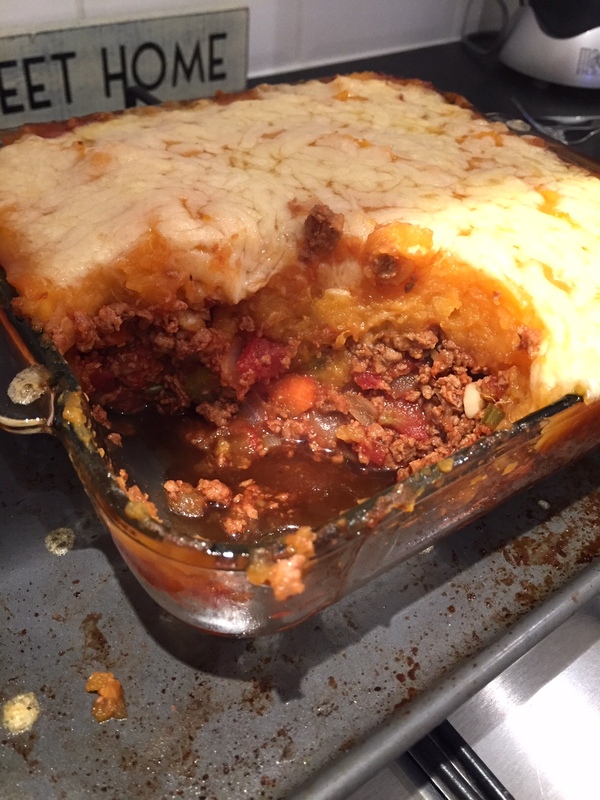 A light sprinkling of parmesan will give flavour without adding too many extra calories and fat, but if you are trying to keep calories low then cook the shepherds pie as is and then add a sprinkling of nutritional yeast flakes to the top around 5 minutes before the pie is ready. Put the Pie into the pre-heated oven for around 15-20 minutes, or until you can see the mince filling bubbling away. Remove from the heat, and then serve – this recipe goes brilliantly with most green vegetables – peas, kale, cabbage, broccoli etc. As mentioned above, this will easily service 4 people, but this dish also keeps really well, so if you are refrigerating or freezing the leftovers, ensure they have cooled down completely before storing in an air tight contained and making sure they are heated well throughout before serving again. Warming, healthy and most of all comforting – this is the perfect weekend dinner dish. Please tag me in your photos if you give this Pie a go – can’t wait to see your creations. Happy eating! Pie! Perfect for the cooler nights. This looks good LJ.